Description:- Dytor 10 mg tablet is used in the treatment of fluid retention (edema), heart failure, increased blood pressure and hypercalcemia (increased calcium levels in blood). Dytor 10 mg tablet lowers the swelling by removing the levels of excess water and electrolytes in the body. Continue taking the medicine even if you start feeling well. Do not stop taking the drug without consulting your doctor. Check your blood pressure one week after starting the drug and consult your doctor if it has not improved. 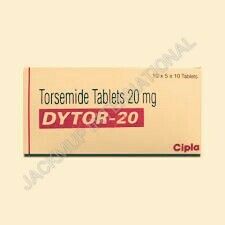 Do not take torasemide if you are allergic to it or to drugs of the sulfonylurea class used to treat diabetes (e.g. glibenclamide, glipizide).